What is a warranty and why do I need one? We would all like to think that we live in a perfect world and that our cars will never let us down but unfortunately the reality is sometimes a little different. No matter how well you maintain your vehicle, components can still fail resulting in costly repair bills. AA Warranty Mechanical Breakdown Insurance has been designed to help protect you against the cost of such repairs. Should a covered component suffer unforeseen mechanical failure, we could help to cover the cost of repairs. We even cover wear and tear on vehicles that have covered less than 60,000 miles and are under 5 years old at the time of claim. An AA Warranty includes parts and labour; diagnosis; European cover; contribution toward breakdown recovery; contribution toward overnight accommodation or your rail fare home; and contribution toward a hire car. Wear and tear is covered on vehicles less than 5 year’s old and less than 60,000 miles at the time of the claim. 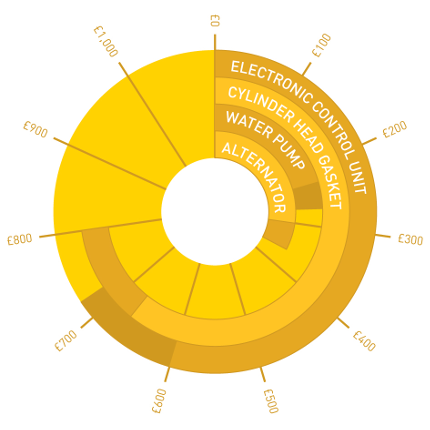 Below is an illustration detailing the average cost of repairs (including parts and labour, with VAT shown) to some of the more common component failures from the AA Warranty Claims Database during 2012. Why is it a good idea to purchase an AA Extended Warranty product? What to ask your salesperson? Ask your sales person if the vehicle you want to buy has any remaining manufacturer’s warranty remaining. If so, your AA Warranty cover can be deferred until your manufacturer’s warranty has expired ensuring continuous protection. If not, ask if the vehicle is eligible for immediate AA Warranty cover. Your salesperson will be able to explain the cover in more detail and help you decide the best level of cover to suit your vehicle. AA Warranty is available for passenger cars, vans and light commercial vehicles up to 3,500kg GVW, Motorhomes and Caravans that are registered within the Geographical Limits. are used for road-racing, rallying, or any other competitive event. If you think that you have a fault that is covered under your AA Warranty, simply call our claims department. You will be asked to provide your policy number and Vehicle registration number, the current mileage of Your Vehicle. Our engineers will be happy to discuss your claim and advise you of your nearest repair centre. They will guide you through the repair and help you through the claims process. Our claims department is open from 9.00am to 5.00pm Monday to Friday, and 8.30am to 12.30pm on Saturday. The office is closed on Sunday. AA Warranty is a trademark of AA Group of Companies and is used with its permission under licence to Motorway Direct PLC. AA Warranty is provided by AA Mechanical Insurance Limited, an appointed representative of Motorway Direct PLC who are authorised and regulated by the Financial Conduct Authority (FCA), authorisation number 311741.